Don’t you love sitting outside on your patio in the late summer afternoons, watching the world go by? It’s great to relax on a comfortable outdoor seat with a glass of lemonade and some free time. But what happens when your furniture is getting shabby and your cushions need to be replaced? Never fear! The Canopy Kingpin is here to solve all your outdoor seating problems. No matter what kind of patio furniture you’ve got, it’s pretty easy to find great replacement cushions for patio swings and canopy sets to fit into just about any budget. And if you’re looking for a certain color, you’re in luck too. With tons of different choices on the market, you can find the right combination of style, color and price to make your patio really pop. So how do you know how to pick the right seat cushion for your furniture? Sure, some cushions are available in custom sizes, but most are pretty standard. If you grab the wrong size, you’ll be stuck with cushions that just don’t work for you. Who wants that kind of hassle? When you’re looking for a cushion, take a minute to measure your furniture. Even if your measurements aren’t exact, they’ll give you a good starting place to help you shop. You’ll know what’s definitely too small or too big to work in your seating. It’s a good idea to know what kind of seating you have, too. You wouldn’t put a high-back cushion in a deep-seating sofa, would you? Most cushions are made in standard sizes to fit the type of furniture they’re built for. Unless you’ve got a really custom or uncommon piece of furniture, standard sizes should work in most cases. Now that you know what to shop for, it’s time to look at what your Kingpin has found for you. He’s gone to a lot of trouble to be sure you have the best pillows to pick from, so do yourself a favor and check out his list of the top 9 replacement seat cushions for sale online. There’s something for everyone here, from patio swing replacement cushions and canopy choices to deep sofas and everything in between. So, are you ready to make your seating comfortable again? Outdoor furniture isn’t all chairs and sofas! If you have a swing chair on your patio, you need a special type of cushion to keep yourself and your family comfortable every time you sit outdoors. Choose this Sunbrellareplacement swing canopy﻿﻿ and c﻿﻿ushion se﻿﻿t to make your swing as cozy as it can be, all while resisting stains and weathering. This cushion can be purchased in a seat and back combo, or just the seat if you prefer to leave the back of your swing open to fit with your décor. It comes in tons of different colors to match any outdoor space, and it’s easy to tie on and get started using right away. Beautiful fabric is high-quality and designed to last for a long time to come. Cushions are well-stuffed for the perfect blend of comfort and streamlined style. Weather and stain resistant fabric will never get mildewed or discolored. Cushions are only designed to fit the Sunbrella swing seat, and might not fit other products. Some fabrics have been known to bleed color onto the swing itself. Cushion must be spot-cleaned only, since outer shell is not removable for washing. Sometimes, you need a little extra style and elegance in your outdoor patio furniture. For a pillow that looks prettier than the more traditional, standard options, choose this stylized cushion set and enjoy a simple but beautiful trim around a cool, peaceful blue pillow. The set includes both the seat and back cushions for a perfect match every time. These cushions are designed for deep-seating and work well with standard sized chairs. You might also be able to double them up and use the in a sofa or loveseat. The fabric is durable and ready to stand up to frequent use from the whole family, no matter what the weather. Very affordable price that will leave you plenty of wiggle room in your budget. Fabric is sturdy and made to last for a long time. Cushions are overstuffed and won’t flatten out, even when you use them again and again. Size may be smaller than desired, even for a standard chair. Only available in one color, which limits your design choices by a lot. Includes only one seat and one back cushion, with no extra sets. For a seat cushion with a lot of options, look no further than these great single-piece pillows! These cushions are designed to fit most standard sized high-back chairs, and made of fabric that looks and feels great both inside and outside. Tie them on and enjoy a variety of different colors and styles, or flip them inside-out and get a whole new look with a different pattern. This set of four cushions may be a little more pricey than some of the other options on the list, but you’ll get more cushions than you would with another choice. 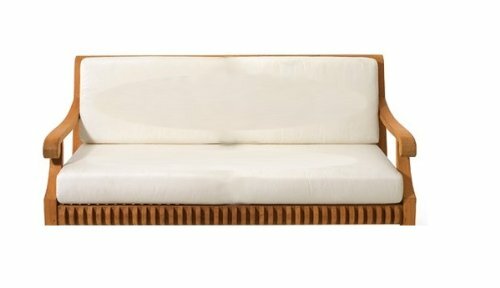 These pillows look great on traditional outdoor chairs, but they won’t work with deep-seating furniture, so keep that in mind when you’re shopping. Reversible fabric gives you tons of choices so your patio can always look great. Weather-resistant fabric stands up to a lot of use and won’t fade. Available in a lot of different colors to help you match your décor. Single pillow style makes it tough to keep these cushions from flattening out. Only able to be spot-cleaned, since casing is not removable. Ties are flimsy and may pull off quickly with frequent use. Modern outdoor spaces are hard to come by, and matching cushions for your black or white patio furniture can be even tougher to find. 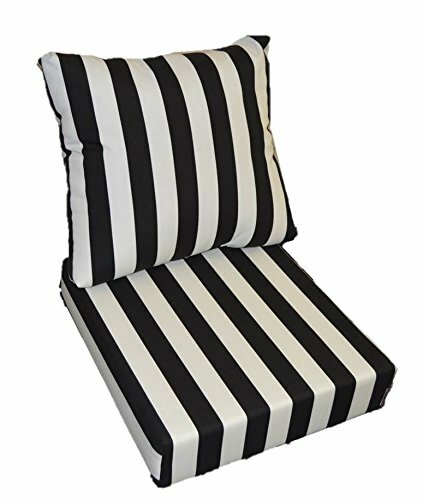 With these bold black and white striped cushions, you can match any minimalistic or modern furniture without having to worry about cramping your unique style. These cushions are treated and stain-resistant, so even the white stripes won’t show spills. This set of cushions comes with a back and seat pillow both, which makes matching your furniture that much easier. They’re designed for deep-seating, and work well with both chairs and sofas. 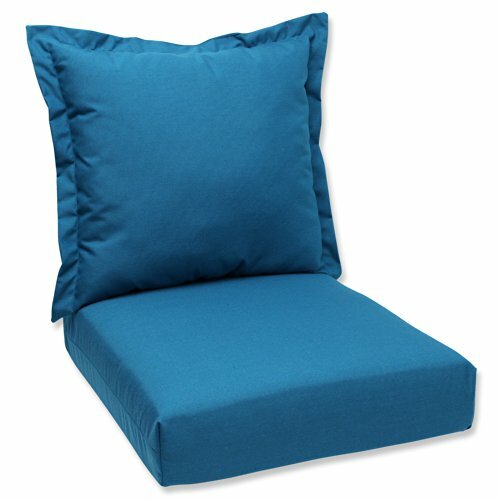 Order the size that best fits your outdoor furniture for a custom cushion that will look great for years to come. Overstuffed style is comfortable and durable even with extended use. Easy ordering process makes finding the perfect fit for your furniture simple and quick. Unique fabric will make your patio furniture stand out from the rest. Must be spot-cleaned only, since outer cover is not removable. Colors have been known to fade with time, even though fabric is weather-resistant. Cushions may slide around and not stay still as well as others on this list. When your seat cushion﻿﻿s need replacing, you’re probably on the lookout for the best bang for your buck. Sometimes it can be tough to find a sturdy, durable cushion that looks good enough to put in your more expensive outdoor furniture. When you go with this Charlottetown cushion replacement, you’ll have the best of both worlds just waiting to keep you comfortable outside. Replace your cushions with this set that includes a seat and a back pillow in a brilliant red-orange to bring some life to your patio. This uniquely-shaped cushion will look amazing and bring a sense of warm and inviting personality to every outdoor event you host. Don’t be afraid to leave it out all the time, since this fabric is weather-resistant! Vibrant color doesn’t fade in the sun, even with extended use. Overstuffed style stays puffy and comfortable for a long time. Comfortable material feels great and looks even better. Because of its unique shape, the back and seat cushions may not always fit together well. Only meant for use with the Charlottetown brand chairs, so may not fit other models. Covers are not able to be run through the washer and must be air dried. Who ever said seat cushions have to be boring? 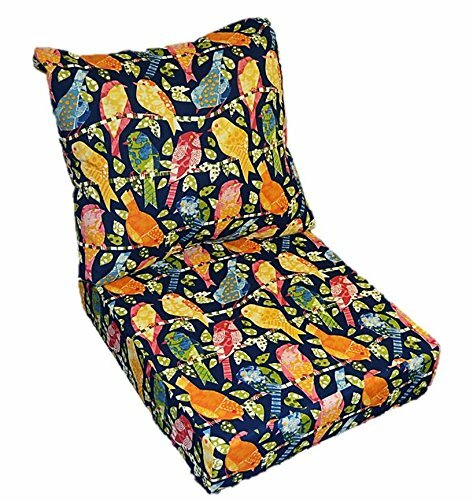 When you’re looking for something more vibrant than solid colors or traditional patterns, take a look at this great bird print cushion for a unique choice that will make your patio stand out from the others on the block. This cushion set includes both the seat and back pillows, so your vibrant print will always have a match. For those of you looking to fit a non-standard size chair or sofa, this cushion set comes in a lot of different sizes. Pick the size you need from the list, and you’ll have the perfect fit every time. Your outdoor space is about to get a lot brighter with these affordable cushions! Unique fabric is eye-catching and durable for just about any kind of weather. Fits many different deep-seating styles with several sizes to pick from. Comfortable fabric won’t retain water or get too hot in the sun. Fabric may make these cushions slide around more than some of the others on the list. Stuffing may get flat in both cushions with just a few uses. Fabric can’t be removed and put through the washer or dryer, so these cushions are spot cleaning only. Are you looking for a little extra splash of color in your patio furniture? 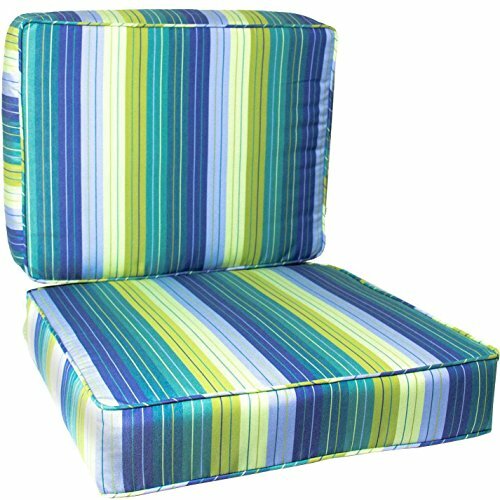 With these big seat cushions, you can bring a lot of bright color and tons of comfort to all your club chairs. These cushions are available in a standard size that works for most club-style chairs, and may work for some sofas too. They tie on and stack together for extra durability. Though these are some of the m﻿﻿ost expensive patio cushion﻿﻿s you can pick, they definitely are well worth the price. The variety of colors and patterns available makes these made-to-order cushions easy to match to just about any style. Best of all, the fabric is easy to remove and wash for those times when accidents happen. Weather-resistant fabric keeps your cushions from getting soggy or sun-faded for years. Easy to remove zipper covering makes washing and drying quick and simple. All cushions are made to order with your specific fabric choice in mind. Stuffing may not stay firm with frequent use, and can get flat fast. Pricey option that may be too expensive for some budgets. Piping around the edges looks nice but can be more uncomfortable for long sitting. Sometimes, your outdoor patio space doesn’t need anything overly fancy. When you want simple style that looks great and holds up against just about anything, you need these indoor/outdoor cushions on your chairs. Coming in at a nice mid-range price, these cushions give you the best of an expensive, high-quality seat without breaking the bank. 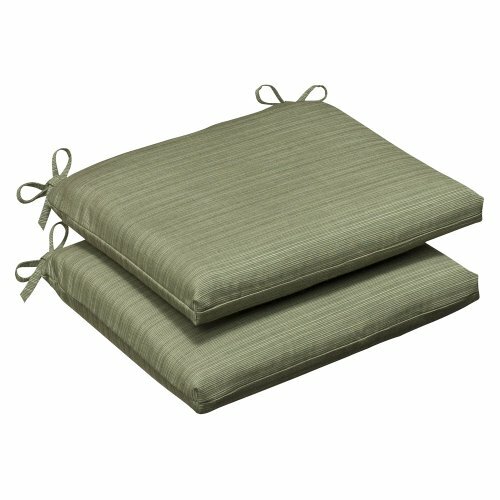 These cushions are designed for use on patio chairs, so they’re not great for sofas or other furniture. Still, they can really spruce up your outdoor space or even your indoor sun room. Tie them onto your chairs and enjoy comfort and elegance all without having to worry about your fabric fading or tearing. They come in a neutral color that is sure to match just about any décor. Stuffed well for frequent use without getting flat. Available in a standard size that fits most outdoor patio chairs. Fabric is able to withstand a lot of weathering without fading or getting moldy. Tie-on design can make these cushions a little harder to position and keep in place. Fabric may be uncomfortable, especially with infrequent use. Outer covering can’t be removed, which means that cleaning these cushions can be a challenge. Are you looking for a great, durable cushion that comes in a wide variety of colors? If so, this is the cushion for you! This c﻿﻿ushion includes both a back and a seat, so you don’t have to worry about picking up both pieces separately. 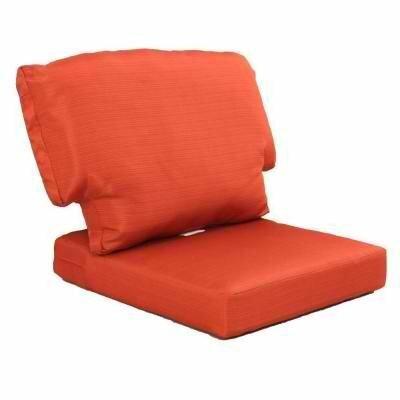 It’s stuffed full to keep you comfortable for long afternoons of relaxation on the patio, and easy to use right away. If you’ve got a lot of kids in the family, this cushion is even better. Since it’s treated for easy cleaning, you can just wipe it down when spills happen. 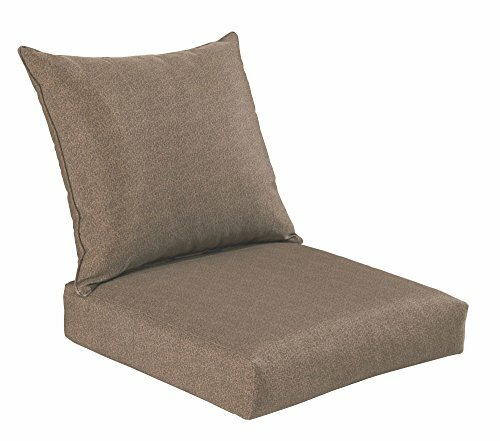 Go with this deep-seating cushion for a great all-around choice no matter what your patio space is like. Overstuffed cushions don’t slide around too much and fit together well in deep seating. Available in a standard size that fits many deep-seating chairs and sofas. Quality fabric resists stains and stands up to weathering and frequent use without tears or fading. Stiff fabric may be less comfortable than some other cushions on the market. Fabric cover is not removable, so it can’t be taken off and put through the washing machine. Back cushion has been known to get flat with frequent use. You’ve got a lot to think about now, and plenty of options to make your outside space look great no matter what kind of canopy swing replacement cushions you’re looking for. With the Canopy Kingpin’s list to help you make the final call, you’re well on your way to a great patio space you’ll want to show off to everyone in your neighborhood! So which one does the Kingpin like best? He prefers the Pillow Perfect Deep Seating Cushion and Back Pillow. Sure, it’s only available in one color, but that’s easy to work with for a way lower price than a lot of the other options on the list. 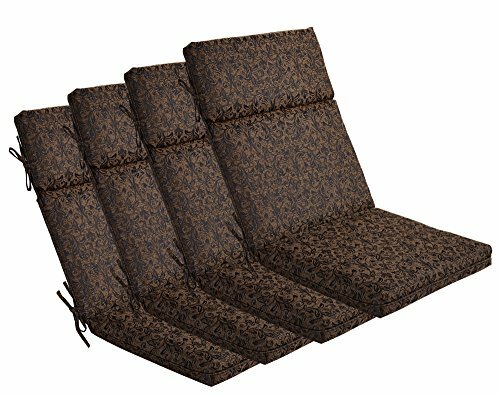 These cushions only work with deep seating, so if you’re looking for replacement swing cushions and canopy sets they might not be great for you. Otherwise, they’re the best bang for your buck with a lot of life and durability to back them up. Plus, the little fringe around the edge looks nice in just about any seat. Bring a lot of color to your patio and choose cushions that will last for years. No matter what you end up going with, any of the cushions on this list are great choices for different reasons. They all get the Kingpin’s seal of approval!